Stinging nettle is a large, rhizomatous perennial wild edible plant that can grow quite tall. Originally from Europe and Asia, this plant has sharp hairs that break easily and can irritate or sting when the plant is touched; however it is a vitamin-rich food source as well as a remedy for various medical conditions. Stinging nettle has been used for hundreds of years to treat painful muscles and joints, eczema, arthritis, gout, and anemia. Fibrous stems of mature plants can be used to make twine, fishing nets, snares and other items. 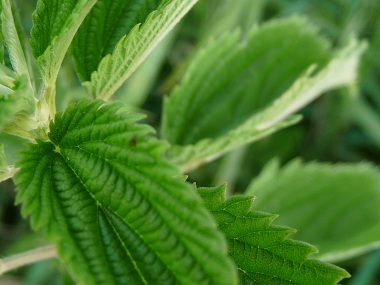 Nettles were traditionally dried and fed to livestock throughout winter. 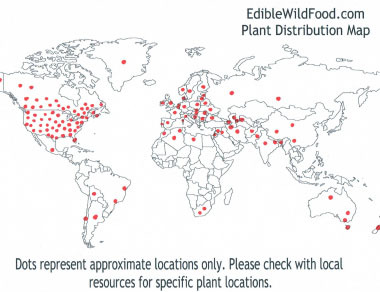 In Europe the plants are harvested commercially for extraction of the chlorophyll, which is used as a safe green colouring agent (E140) in foods. There are between 30 and 45 species of flowering plants of the genus Urtica in the family Urticaceae. Distinguishing Features: Sharp, stinging, tiny hairs encompass this entire plant. 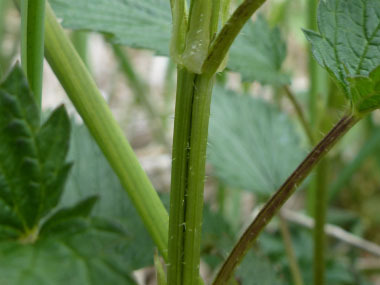 Stinging nettles have tiny, fuzzy-like white flowers. This plant has a spinach-like taste. Caution: When collecting stinging nettle always cover up all exposed skin. The swollen base of each tiny, hollow hair contains a droplet of formic acid. When the hair tip pierces the skin, the acid makes it into the skin causing anywhere from an annoying itch or burning that can last several minutes or a couple of days. Rubbing the stings with stinging nettle root or jewelweed has been used to suppress the itch/burning sensation. Flowers: Stinging nettle is a dioecious (staminate and pistillate flowers on different plants) plant with very small flowers. Staminate flower is greyish yellow: four tepals (like sepals). The flowers have four stamens and yellow anthers. Pistillate flower has four tepals in different-sized pairs, are greyish green and hairy. It has a single carpel and the stigma is brush-like. Inflorescence is catkin-like, 4–8 cm (1.6–3.2") long. 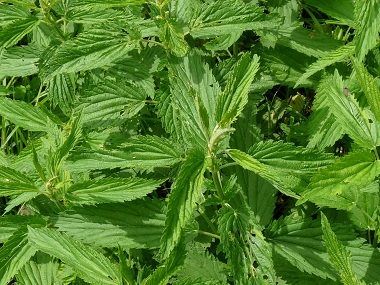 Fields of Nutrition has medicinal benefits and vitamin/mineral content of Stinging Nettle. Leaves: This plant has fine toothed, tapered, somewhat heart-shaped leaves that are 3-15 cm. Thin catkins of tiny green flowers grow from the leaf axils. Height: Generally 1 metre but can grow up to 2 metres depending on location and soil condition. 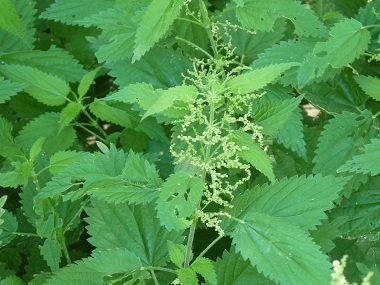 Habitat: Nettles generally appear in the same locations every year. They thrive in rich soil, moist woodlands, thickets, disturbed areas, along partially shaded trails and riversides. Similar plants: False Nettle, White Dead-Nettle. For more in-depth information (e.g. nutrition, medicinal values, recipes, historical information, harvesting tips, etc.) 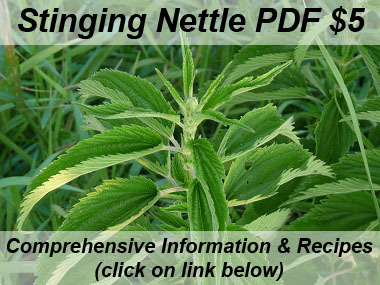 please check out our Stinging Nettle PDF magazine.